When it comes to the weather changing from colder temperatures to warmer temps, picking out an outfit can get tricky. You really want to start wearing all the cute dresses that are out in the stores but it’s still too cold or windy. One of my favorite outfit combos that gets me in a dress but still keeps me warm is the maxi dress & moto jacket combo. 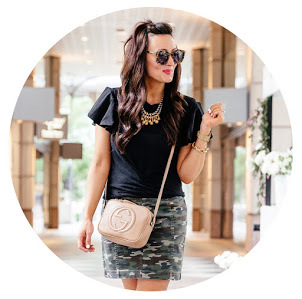 One of my go-to outfits during the transitional seasons. When I think maxi dress, I think easy style. One piece of clothing that takes little effort to accessorize and wear. Throwing a cute moto jacket over it & adding a statement necklace adds a few fun layers & really takes the whole outfit up a notch. I talked about the importance of having at least one really good moto jacket in your closet at all times in this post here & I really have to say that this brown suede moto jacket was worth every penny. Such a good investment and a great color to transition through your wardrobe during the changing seasons. I can’t get enough of this fringe statement necklace. I thought it was such a different and unique design when it first got released and I wasn’t sure how much I was going to wear it. Little did I know that it would become one of my favorites. I love throwing it over any high neck shirt or dress that carries a pattern because it really makes it stand out & pop. It’s time to dig out some of your maxi dresses from past seasons & invest in a cute moto jacket. An easy outfit that’s perfect for the season right now. Thanks for stopping by and taking the time to read my blog. It really means so much to me and I can’t explain how grateful I am for all your support! My blog has tripled in views over the past two months and I owe that all to you! Thank you!